wpForo Private Messages addon installs like any other plugin for WordPress. Access to wpForo Private Messages is provided immediately once you paid for your order. Upon completing registration/checkout, you may log in at gVectors.com. We will also send you an email after registration/checkout, with a link to the login page. Then download the installation package. On forum front-end you can manage private messages in My Profile > Messages page. If for some reason you cannot install this plugin using WordPress plugin upload system please do that with this alternative way. Unzip, and then upload the /wpforo-private-messages/ folder to your /wp-content/plugins/ directory using an FTP application like FileZilla; or any other FTP program is fine also. Make sure you have not double /wpforo-private-messages/wpforo-private-messages/ directories nested inside each other, please correct this before you continue. 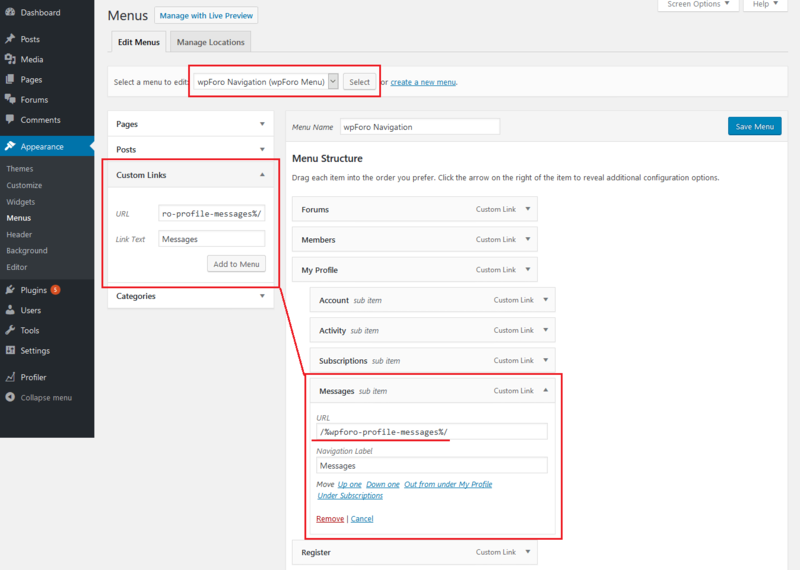 Then in WordPress, go to WordPress Dashboard > Plugins, and then activate the wpForo Private Messages addon. Addon automatically adds Messages subMenu in Profile subMenu Bar. It doesn’t add Messages subMenu in main Menu bar. You can add it using /%wpforo-profile-messages%/ Shortcode URL with “Custom Links” menu item in Dashboard > Appearance > Menus admin page. This will add a new subMenu Messages under My Profile in Main menu bar.